Lunch and Reading Discussion of Matsutake Worlds and Experiments in Collaboration and Time Noon at the Center for the Humanities (Literature 310). RSVP Here. 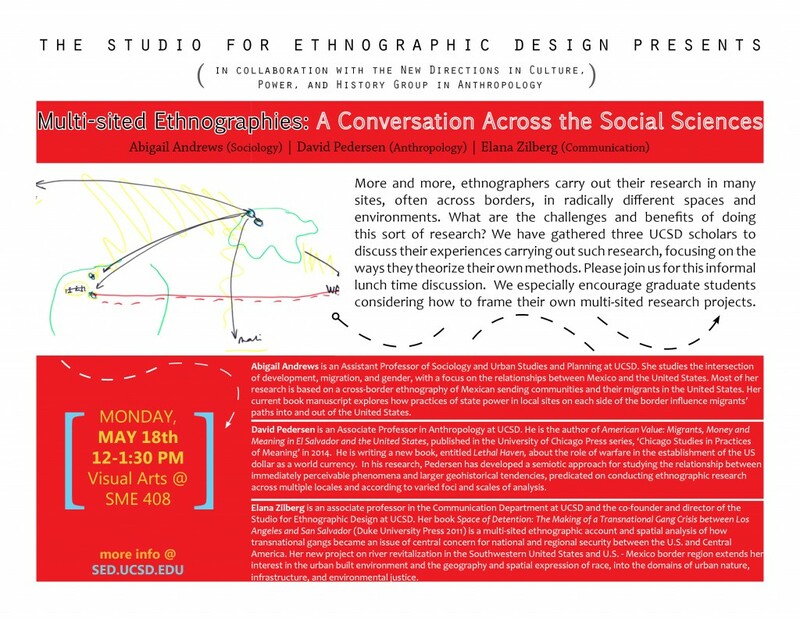 Join SED at the Center for the Humanities for lunch and an informal discussion in preparation for Anna Tsing and Elaine Gan’s talk the following day. Matsutake Worlds is a global collaboration documenting multispecies cultures and ecologies where life continues in the midst of great disturbances. We promise talk of fungal clocks, mycorrhizal life, and the chance to stuff the conversation with your best mushroom-y metaphors. Since the bleak appreciation that we may have to do without narratives of progress, questions of how to understand time have reentered social theory. Most importantly, the realization that progress may not produce technologies to clean up our environmental messes requires that scholars appreciate the rhythms of other organisms with which we make and remake the earth. 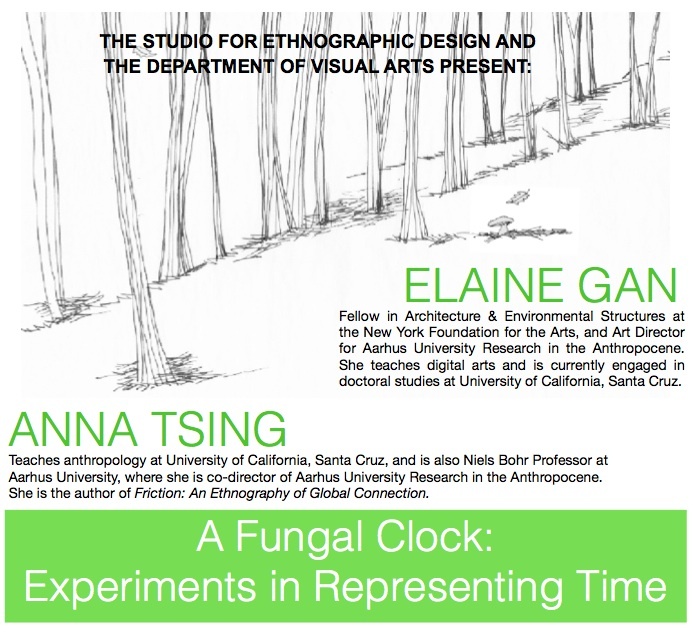 “A Fungal Clock” is a series of collaborations between anthropologist Anna Tsing and artist Elaine Gan. As visual essay, web project, and game, different experiments offer tools to imagine history and temporality that take into account multispecies coordinations. Progress conflates trajectory, or movement, and time, or sequence; without progress, the two are quite different. Progress focuses our attention on the unilinear trajectories of plans; without progress, we must look at landscape-making effects, that is, unintended design. Multiple historical trajectories, human and not human, interrupt, interfere with, and change each other. They trigger new conjunctions. Our fungal clock attempts to show interweaving temporalities as different kinds of coordination. It draws attention to more-than-human social relations that scaffold human histories as the planning modules of progress dissolve into unplanned ruins. This entry was posted in Events and tagged collaboration, events, multi-sited, multi-species, sensory ethnography, time on April 15, 2014 by kdewolff.